I have previously wrote about getting a Marc by Marc Jacobs laptop sleeve here but as soon as I saw the BookBook laptop sleeve, I knew I had to have it! 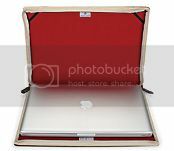 The BookBook laptop sleeve is actually made to fit Apple Macbooks but I am NOT a fan of anything Apple and do not own any of their products. Perhaps hard to believe in this day and age, but I am very much Apple resistant! I digress from the topic but the BookBook laptop sleeve actually fits my Lenovo X300 quite snugly. 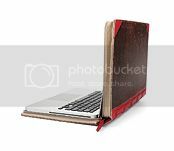 The BookBook laptop sleeve is an ingenius way to disguise a laptop in a book case and I absolutely love it for that! It comes in red and black and I purchased the red (obviously!). It is sturdy and it has been holding up pretty well. You can purchase one here. Prices vary depending on the size of the sleeve: $79.90 for 13″ and $99.90 for 15″. 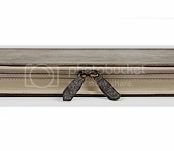 This entry was posted in Laptop, Shopping, Technology and tagged BookBook, laptop sleeve, tech chic on July 14, 2011 by fauxionista.